Like many of the early strong competitors in the microcomputer game, North Star Computers is mostly forgotten these days. The company was founded by Mark Greenberg and Charles Grant in 1976 to sell IMSAI computers in Berkeley, CA. Originally called Kentucky Fried Computer, a lawsuit from . . . Kentucky Fried Chicken . . . and forced them to consider a name change, which they ultimately did. Also like some other computer startups of the time, North Star began making and selling add-ons for S-100 bus computers. Their first product was the Floating Point Board, which implemented a floating point coprocessor for 8080-based micros. They soon added a Z80A processor board, as well as RAM boards to their lineup. North Star went on to bring to market one of the first disk drive systems targeted to the hobbyist microcomputer market. This product was not only highly significant for the ecosystem at the time, but would also play an important role in all future products developed by North Star. The Micro-Disk System was a hard sectored floppy disk system based on the 5-inch Shugart SA-400 mechanism. A diskette could hold up to 89KB of data, which was plenty in 1976. The drive was bundled with an S-100 bus controller and ROM that contained both the bootstrapping code, as well as North Star DOS – AND – North Star BASIC. The MDS (Micro-Disk System) cost just $699. So, what happened next, well, you guessed it, North Star took many of their existing products and put them together with a couple of new tricks and created their own computer in 1977, the NorthStar Horizon! A standard machine had the Z80A processor, was S-100 of course, and shipped with 16 kB of RAM. It could arrive with either one or two of their fabulous disk drives, mounted internally, and you could even add up to two more externally. Also included were serial interfaces for connecting to a terminal and printer, plus inside, additional chips on the motherboard which competing micros did not include. They had to use additional S-100 cards to add a lot of the “out-of-the-box” functionality that the Horizon shipped with. The case could hold to twelve additional S-100 cards. It could run either CP/M or North Star’s own NSDOS. When the NorthStar Horizon was announced in November of 1977, it was one of the first micros to include built-in disk drives. It also sported a handsome wooden cabinet, which was later changed to an all-metal case. The company name was originally displayed as NorthStar, then later changed to North Star. To build one with one floppy drive, it cost $1599, or you could order one assembled for $1899. With two floppies, the kit price went up by $400 to $1999, and the assembled by $450 to $2349. 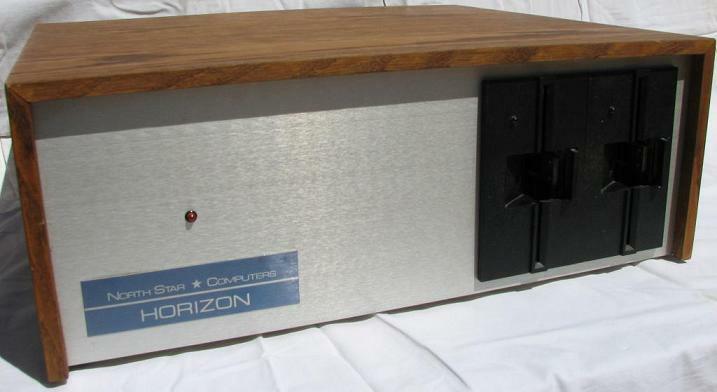 No knock on its predecessors, but the NorthStar Horizon was an impressive and mildly revolutionary system when compared to the Processor Technology SOL-20, IMSAI 8080 or the Altair 8800. North Star went on to sell the Advantage in 1982, and then the Dimension in 1984. The Advantage had the, well, advantage, of adding an 8088 coprocessor board which then allowed it to run MS-DOS. The Dimension was a server product for the company, as well as their first fully PC-compatible. North Star’s early and significant product, the hard sectored floppy drive ultimately was both their blessing, then their curse. The company stuck with them until the end, even though the rest of the industry had long before adopted soft-sectored disk drive technology. Many software companies did not want to invest in the more difficult and costly process of porting their product to hard-sectored diskettes. The company closed its doors in 1984. NorthStar Horizon was posted on Friday, November 14th, 2014 at 9:02 am. This post is tagged and is filed under 1977, Desktop Computing, NorthStar, S-100, Tier One Computing Devices. You can follow the replies through the comments feed. Pings are closed but you can Leave a comment! We take for granted our “GB” sized hard drives today without realizing how much the technology cost for even 0.5% of today’s hard drive space back in those days. I have a 5MB hard drive for my TRS-80 Model IV that would have cost over $2000 in the early 1980s! A Blueberryware theme › 45 queries in 0.365 seconds.